Natasha Appelman-Dijkstra (1980) is an internist-endocrinologist specialized in osteoporosis, metabolic bone diseases and calcium/phosphate disturbances. She received her MD in 2004 (Leiden University) and registered as an internist-endocrinologist in 2012 (Leiden University Medical Center). In 2015 she defended her thesis, titled “Longterm effects of cranial irradiation and growth hormone therapy” (Leiden University 2015). Since 2012 she works as a staff member at the Leiden University Medical Center (LUMC) where she developed the Coordinated Care Trajectory Osteoporosis which was rewarded a Gold medal from the International Osteoporosis Foundation for operational excellence and also was reponsible for several successful research projects. After 2015 she solely focussed her research on bone and mineral diseases, combining her daily patient routine with clinical research and the supervision of PhD students. For her work on the new technique of impact microindentation in vivo she received an American Society of Bone and Mineral Research Young Investigators Award (2014) and is a Center of Excellence for this technique. Natasha received research grants from the Dutch Paget Foundation (2015), Amgen (2015), UCB (2017) and has a joined funding project for crowdfunding/funding research in Fibrous Dysplasia (Beter Bot). 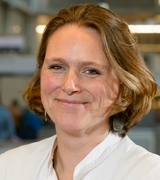 Since 2016 she is the head of the Center for Bone Quality in Leiden and the co-founder and secretary of the “NVE-BoNe”, a national working group for calcium and bone disorders of the Dutch society for Endocrinology (NVE). Natasha is an active member of the Dutch Hyperparathyroid Study Group, a multidisciplinary alliance between several Academic and non-Academic hospitals to improve the care and research in parathyroid patients. In November 2017 she was elected president of the Dutch association for calcium and bone research (NVCB). Natasha is PI on several clinical initiated and industry sponsored studies in the field of impact micro indentation, rare bone diseases, osteoporosis and parathyroid-disorders. In 2018 Natasha sponsored the European Calcified Tissue Soctiety Translational Fellowship of Manuela Schobb, MD in Leiden on impact microindentation. Find more information on Researchgate.